We walked into the hotel’s pool area and smelled the chlorine lingering in the air. It wasn’t a typical pool day, though. There were chairs lined up near the water, and our preacher was already hard at it explaining the purpose and benefits of baptism. Several folks got up when he was nearly done and began to make their way over to the pool. These had all expressed a desire to be baptized, and I’m sure had been through a session with the pastor on the significance of their decision. I love watching people get baptized. It’s like witnessing a holy, heavenly event right in the confines of our earthly setting. I talked to one man and the little blond girl’s mother after the event, and it was clear that each had a real understanding of the personal choice they had made. Although Jesus made it clear that we all are to be baptized, I know it’s important that our hearts are in the right place before we do it. If you’re familiar with the comedy film Nacho Libre at all, you know that it’s set in a Mexican monastery and is the story of a young man who was raised there but longs to be a professional wrestler. But in one scene, Nacho shows concern for Esqueleto’s salvation and asks him why he has never been baptized. Esqueleto says that he’s just never gotten around to it and Nacho responds by coming up behind him and quickly dunking his head in a bowl of water. The scene is funny and Nacho means well, but you know baptism doesn’t work like that does it? It has to be a decision that each of us makes on our own. And, we need to have a thorough understanding of the meaning of it. When a pastor mentioned a new baptism opportunity a while back, I looked down at my long row of children and hoped that they would choose to participate. I used to nudge them and whisper in their ears that they should be baptized, but now I’ve learned that it’s a choice that I need to let them make on their own. A melody about baptism kicked in my head just a few moments ago, and I strained to remember its song. I had just been saved – a teenager in the early 80’s and contemporary Christian music was starting to really take off. I listened to Petra, Keith Green, and also liked the Imperials. And, after doing a Google search, I landed on the Imperials’ baptism song in a matter of seconds. “Water Grave” had been one of my favorites. With a catchy beat, the song starts out with these lyrics: “In my house there's been a mercy killing. The man I used to be has been crucified. And the death of this man was the final way of revealing, in the spiritual way to live, I had to die. 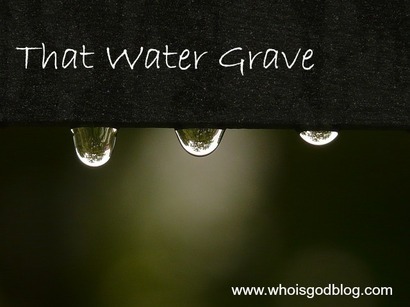 Images that come with the idea of a water grave can be a bit eerie, I know. But when we understand what really happens in baptism, that through the act we are identifying with the death and resurrection of Jesus Christ, I think we get a much brighter picture of its meaning. 12 For in baptism you see how your old, evil nature died with him and was buried with him; and then you came up out of death with him into a new life because you trusted the Word of the mighty God who raised Christ from the dead.